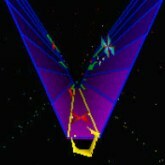 Description: Tempest 2000 is an amazing on rail space shooter released for the Atari Jaguar. Based off of the first Atari Tempest arcade game. There are 99 challenging levels in all to play through, with 16 different level web designs. Some level webs are harder than others. Make sure you collect every power up, as they will help greatly in later levels. As enemies are coming towards blast them as fast as you can before they reach you. A really great game to play if you want to test your reflexes. NOTE: Play Tempest 2000 mode its the funnest! Game Controls: Enter Key = Start Button. Arrow Keys = Move. "C" Key = Shoot. Select the option icons located at the bottom of the game screen to edit controls, Play In Full Screen, Save/Load game progress, and change graphics settings.